Carve top off of pumpkin. Using a large spoon, scrape insides of pumpkin, removing pulp and seeds to a bowl. Pick out seeds from pumpkin pulp, placing seeds in a separate dish. Rinse any remaining pulp off of seeds. Spread seeds on paper towel to dry, then pat dry with additional paper towel. Spread dried seeds on baking sheet and drizzle with oil, mixing seeds to evenly coat with oil. Season to taste with salt and pepper. Bake for 25-30 minutes until lightly golden brown. Let cool and serve! If you're using the same pumpkin for decorative purposes then be sure to cut the pumpkin top with the tip of your knife angled to the centre of the pumpkin. Producing an angled cut will allow the pumpkin top to rest back on the pumpkin without falling through the hole. If you wish to avoid messy hands, wear gloves while removing the pulp from the pumpkin and the seeds from the pulp. 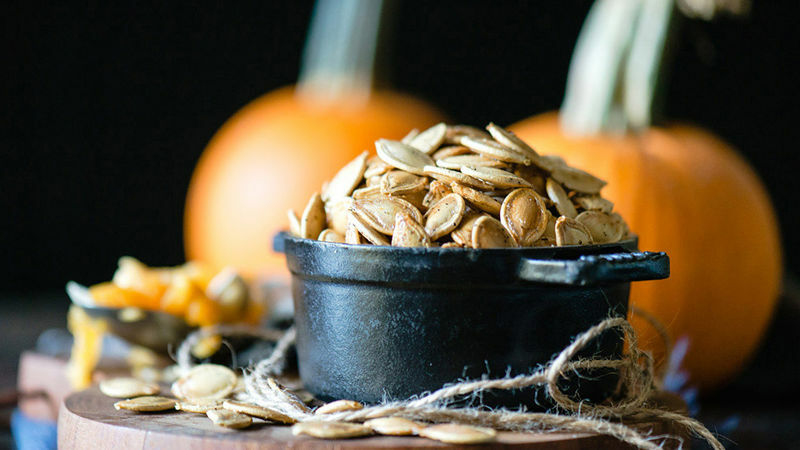 Pumpkin seeds are an easy and delicious fall treat. I don't know about you guys, but when it comes to carving pumpkins there's one thing I care about, and it's not carving the pumpkin... It's the seeds! Sure it may be a bit of a pain picking out all the seeds, but they are totally worth it when you're snacking on those golden brown, crispy, delicious little things! When October rolls around and I'm thinking about Halloween, making costumes, and carving pumpkins, those last two things are usually done with one hand – as my other hand is busy digging into a bowl of pumpkin seeds and stuffing my face. It may not be productive, but it is delicious! 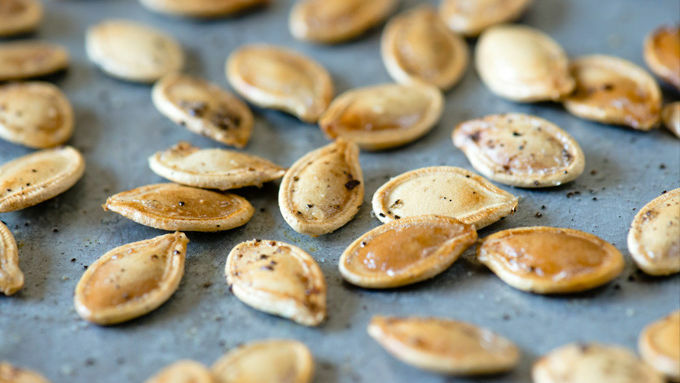 While it can be a little tedious, roasting pumpkin seeds is simple. Start by picking out a nice-sized pumpkin, in hopes that it will give you lots of seeds. Then take your prized pumpkin home and get to carving! Start by cutting around the stem of the pumpkin. If you're going to be making a Jack-O-Lantern, be sure to cut the top with your knife at an angle, with the tip pointed towards the center of the pumpkin (where the stem is). By cutting at an angle, you'll be creating a pumpkin top that won't fall inside the pumpkin. Once you have cut the top off, take a large spoon and scrape around the edges of the pumpkin, removing all the pulp and seeds. Once all the pulp is removed, start picking the seeds from the pulp. This can get a little messy, so feel free to put on some latex or plastic gloves! Pick out all the seeds into a separate bowl, rinsing them clean, placing on a paper towel, and dabbing them with another paper towel until dry. Preheat your oven to 375°F. Dump the seeds onto a baking sheet and drizzle with olive oil, mixing the oil into the seeds and spreading them out. You're welcome to season them with whatever spices your heart desires, but this time we kept it basic, seasoning with some salt & pepper. Once your oven has preheated, place the seeds in the oven and roast them for about 25-30 minutes until golden brown. Once roasted, remove them from the oven, let cool, and serve!